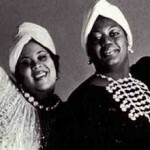 The duo of Martha Wash and Izora Armstead were originally called Two Tons O’ Fun for obvious reasons before they took on the moniker of The Weather Girls. The song was written by producer Paul Jabara and “Late Night with David Letterman” band leader Paul Shaffer. The group also provided backing vocals for the likes of Bob Seger, Sylvester and Aretha Franklin. Martha Wash later went on to sing lead vocals on Black Box’s “Everybody Everybody” and C&C Music Factory’s “Gonna Make You Sweat (Everybody Dance Now).” Over the years, this song has become a gay anthem…just in time for Pride Day!